Unfortunately the blog has been moved to rhadlife.posterous.com due to technical difficulties with the WordPress mobile app. It has been a crazy day where I have set up the blog in a couple of other locations (Tumblr, Blogger) but Posterous has been the most user-friendly and I was able to move all the content over so this location is effectively a dead link but I will leave it up just in case someone stumbles across it!! Thank you so much for your patience. I am very excited at the functionality of the new site – especially the true embedding of the YouTube videos. I can even post video only on the blog if it is not really YouTube worthy. See you over at rhadlife.posterous.com! 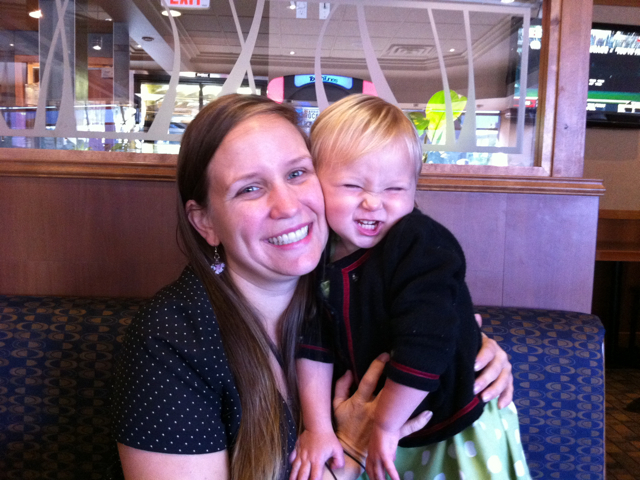 We are back from another Rhad weekend… This time up in Kelowna where we visited Nanny & Papa. Before I get to all the highlights it looks like I am being forced to find a new location for the blog. The software was updated again yesterday and is even worse so depending how long it takes to set everything up there may continue to be delays to the updates. My goal is to get back to a daily update with lots of pics and video because Hana is growing like a weed and is so much fun right now!!! Unfortunately there will be no pics in this post as it is simply too painful. There are some new videos posted on our YouTube channel that I will post throughout this blog though! Anyway… My folks are having their house renovated (new hardwood floors and paint throughout) so we had to come up with a plan if we wanted to spend Thanksgiving with them as they were unable to come down for a visit. Rhondi worked her magic and booked us into the Lake Okanagan Resort using our timeshare points for 4 days starting Saturday. Now first of all the place sounds a lot nicer than it was… Back to that later. We left our place just after 10am on Saturday. Hana was great in the car as usual dancing up a storm in her car seat. We stopped in Merritt for some lunch and we got to the “resort” just after 3pm. Things did not start out so well as RCI (the timeshare exchange booking company) put us down for a Sunday to Thursday reservation. Luckily it is not peak season so they were able to change it to the Saturday to Wednesday that we had asked for when booking. Nanny & Papa were scheduled to arrive around 5 so we went to set up in our 3-bedroom condo. It was located in the oldest portion of the complex which was disappointing at first but it actually worked out to be great in the end. We did however have to fork over 29,000 points (our Vegas 1-bedroom is worth 61,500 points) PLUS the $112 exchange fee PLUS the $100 housekeeping fee which is charged directly by the resort for staying less than a week. Rhonda called the front desk to see if we could get moved to the brand new buildings right on the water while I made a list of the things I was not happy about and called RCI to see what they would do as this was pretty steep for what we were actually getting. They ended up giving us another week somewhere else using none of our points but just paying the $112 exchange fee… Not too shabby at all. My list of unacceptables and disappointments grew over the weekend but now it was just a list and we could get on with making the best of it. Nanny & Papa came up and brought leftover pizza and a tonne of food which kept us from having to go to the store at all – that was very helpful as we are on a very tight budget these days with the Special Levy for our building envelope that is under repair and also with me being off work… We cannot thank Nanny & Papa enough for their endless generosity. My mom also brought a big pot of chili with her which got us all ready for the Canucks season opener versus the Kings. They played well but let the Kings back in late before losing in a shootout. My Dad had to leave early as Princess & Ebony (their dogs) were not allowed at the resort plus he had to work on Sunday. I am proud to say that is the last Sunday he ever has to work as he is retiring October 31st! And it’s about time as December 17th he turns 69!!!! Rhondi & I attempted to watch SNL but, of course, we passed out as usual. Sunday we got to sleep in a bit as Nanny got up with Hana. We had a nice lazy morning and Miss Rhondi made some Rhad cakes of pan! Nanny took off to get turkey dinner ready and we went swimming in the outdoor pool and hung out in the hot tub. It sounds glamorous but it was a 15 minute walk from the condo and it’s not exactly summer – but hey, good on us for defying Fall! We had a very scary moment on our way back home from the pool… One that I am sure many would love to look at me and say “I told you so”. Since Hana walked all the way to the pool all by herself I agreed to carry her back home on my shoulders. I was wearing my flip-flops and as I was going up the stairs my flip-flop caught one of the stairs. Now I was holding on to Hana’s feet at the time but the natural instinct when I tripped was to put my hands out in front of me to brace myself. This unfortunately threw Hana backwards. Luckily she and I both stayed very calm and basically ended up resting on me back-to-back and then I reached behind me holding her head and Rhonda grabbed her from me. We were all a bit spooked especially Hana but she was back on my shoulders again shortly once I explained what happened. I made sure she knew it was my fault for not holding on to the railing and that I would be sure to do that in the future. We all went back to the condo for a nap and then headed down to Nanny & Papa’s for Turkey Dinner. It was an awesome dinner as usual… My mom boils all the vegetables in salt beef like they do in Newfoundland… Soooooooo good! We then were spoiled with her infamous lemon merengue pie before heading back to the condo for the night. Nanny & Papa came up for another visit and we had some leftover “hash” as my Mom calls it – it is basically all the leftovers thrown together to make a bit of a stew and damn good. We had more Lemon merengue pie and sat and watched the Canucks eek out a win against the Florida Panthers. Papa had to head out early again to take care of the dogs and go to work in the morning. Tuesday was actually our last day as we decided we were heading home late at night so that Rhondi was available for work Wednesday morning. 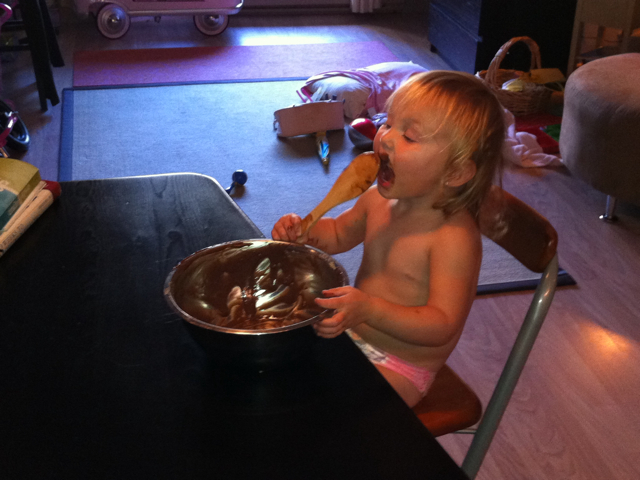 Rhondi made pancakes again and then Hana & Nanny went for a trek for about an hour. We could see them playing in the tennis courts from our condo. They had so much fun and found lots of goodies like 8 golf balls and a huge wooden horseshoe that we plan to use as part of a frame for the horseback riding memories. We gave Nanny a ride home, had some lunch, headed back to the condo to play in the playground, play around on the golf course and have a family nap before we headed home at 8pm – this way we avoid any traffic and Hana can sleep all the way home. She is really great in the car but it sure can be boring when you are awake and stuck in that seat in the back! I am sure there are a million little side stories to tell but it is now 3am and I must get some sleep. I really hope I find a better solution for the blog so that the pictures tell more about the side stories. All I can say is that Hana seems much older than 22 months old and we not only love dearly but are so proud of her – you go girl!!!!! The last 3 days have been full of notable moments that I will try to relay as best as I can with the short-term memory I have taken on in the past 4 months. 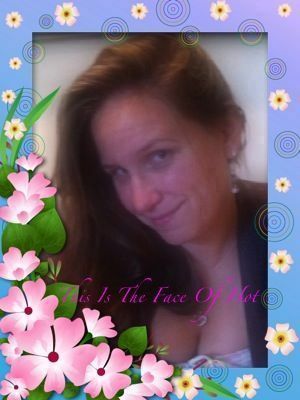 As the title (submitted by Miss Rhondi) suggests almost all of the notable moments have included water. Unfortunately I did not get any pics or video of the most notable moment but it was a pretty big day for Miss Hana in the pool. She has been jumping from the edge of pools into our arms (mostly Rhondi cuz I am too crazy!) for a few months. I asked her to trust me in that she could jump into the water all by herself and I would bring her back up. She did that and went multiple times before she said to me ‘self, self! Daddy back!’ So I took a couple of steps back and she jumped into the pool all by herself and held her breath until she came back up to the surface. Only at that point did I help her get back to the edge so that she could climb out all on her own and do it again. It was soooooooooo awesome and I am so choked I don’t have it on video!!! Jessica was so nice to take Rhondi to Nook on Robson & Denman for a birthday dinner as she was unable to make it out Rhondi’s Volleyball Beach Party. Of course that just meant that Birthday week was being fulfilled! Wednesday was another memorable water moment only that it wasn’t really a moment at all. Remember the 3-hour bath Hana had last Thursday??? Well she blew that record totally out of the water… She was in there for 5 and 1/2 hours!!!!!!! I checked what the Guinness World Record but was unable to find out if this was a record or not. Then after her nap she walked all the way to the Y from our home by herself (Pacific @ Thurlow to Burrard @ Barclay) which according to Google Maps is exactly 1.0 km!!! We went into the pool again where she did more solo jumping and lots of good kicking and trying to swim to me on her own after holding onto the edge. We hung out in the water for a while throwing rocks. We then met a couple of other kids (Maggie – 15 mos. & Henry – 18 mos.) on the beach. The two of them played on Hana’s trike in exchange for a healthy ransom of Goldfish, raisins & arrowroot cookies! After they left we sat around and gave some Goldfish to a seagull, collected bottle caps and tried to make each other laugh. It was another truly Rhad weekend and I am totally exhausted so I will keep the words to a minimum while keeping the footage to the max in both photos and video. We have had Jack Johnson/G. Love at the The Gorge @ George penciled on our calendar for about 6 months. Thursday morning Rhonda found a pair of tickets for the show and the plans were set… pack our bags first thing Saturday and head out. OK – there really was no plan but we had a destination – again another reason I love Miss Rhondi so much. Our life is one big Rhad adventure – hence the whole RhadLife thingamabobber. We left our place later than expected but we were on the road around 8am, picked the tickets up in White Rock and we were on our way. Rhonda’s university buddy Robyn and her hubby Brenin as well as their 2-month old son Jackson are in town for a couple of months staying in Sedro-Wooley (about 20 minutes south of Bellingham). They are currently living in Abu Dhabi where Robyn is on a teaching contract and Brenin is studying to be a CPA online back in the US of A!). We called them to see if they were up for a visit and they were as gracious as always. We popped in for about an hour before heading on our way. They also invited us to come back after the show to stay the night and watch the Seahawks play the Rams on Sunday. The Gorge is not a short jaunt but well worth the drive. This time we took the scenic route as well going east on the #2 highway in Everett which took us through the coolest little Bavarian town called Leavenworth. We have been this way before but were in for a great surprise as it was Oktoberfest and the town was packed! We found a 15-minute parking spot and walked around a bit. If it were not for that parking spot we may not have made it to the concert. Hana was absolutely awesome in the car as usual – dancing, laughing, gabbing and when she realized the drive was not going to end anytime soon she closed her eyes and went to sleep. The girl is amazing I tell ya – this was no fluke, you can see her make the decision that she is sleeping and forcibly closes her eyes and goes to sleep! Hana and I went and toured around for a bit which was awesome as there were not many people there yet and the place is simply a natural wonder! If you haven’t been please do yourself a favour and make the trip there in your lifetime – the sooner the better because you will end up doing it more than once. G. Love and Jack Johnson actually did an impromptu acoustic set just after 5pm for a few songs on a little side stage for about 200 people who were there early enough and happened to walk by – there was no announcement so a lot of the people in the venue did not even know it. The main show started with a girl we had never heard of named Zee Avi. She was OK but we were definitely excited to hear G. Love and Jack as we are fans of both of them. 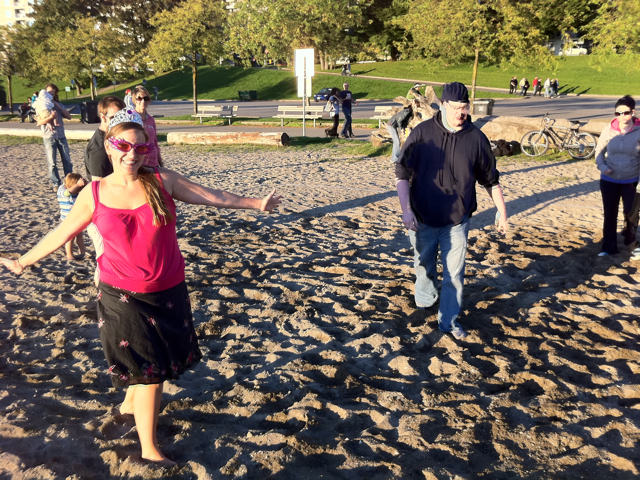 We decided to hang around Stanley Park for a bit afterwards as we still had about an hour left on our parking meter. We went and checked out the ducks, fed the squirrels some cashews and basically frolicked through what has to be one of the most beautiful places in the world – and it is just down the street from us. Seriously – we are so freakin’ blessed! We then checked out Hana’s favourite art piece (video by others) before finally heading home to call Nanny & Papa, snuggle a bit and then off to bed. If that weekend is not the definition of RhadLife I don’t know what is! 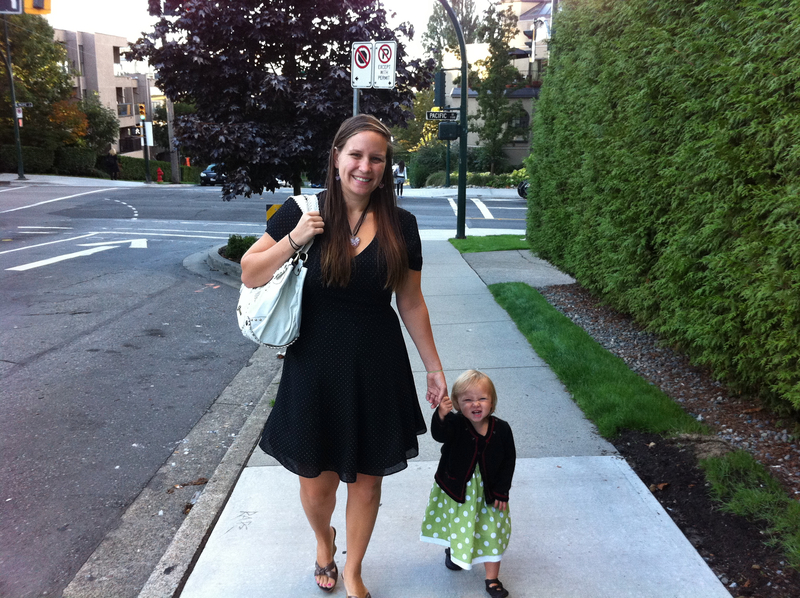 Next weekend we are off to Kelowna to hang out with Nanny, Papa, Princess & Ebony – can’t wait! Miss Rhondi definitely made this staying-at-home thing look easy. I am pretty good at it when everyone is well and there is a tight routine. The party planning this week threw me right out of whack and Hana is feeling a little under the weather today so that has increased the degree of difficulty around here. Hana had a good sleep and was up at 6:15. I went in to get her and she was pretty cranky as she almost always is when she wakes. Her voice was all gruff as well and did not sound well. I tried to give her a hug but she was pretty distraught as she could not find one of her dolls. I helped her find it and she proceeded to put all 3 of her faves (Blue Baby, Purple Baby & Patch) in her arms. I then asked her for a hug and she threw them all back down on the bed and gave me a huge squeeze (at least 30 seconds) and then laid a big kiss on me. It was so sweet and just one of the priceless gifts of being a parent. I asked Hana if she wanted a bath and she said yes which is pretty rare. One of the highlights of yesterday is the fact that Hana had a three-hour bath!!!! (There was no blog yesterday as I actually finished Wednesday’s blog this morning!) She was just loving it and had ALL of her toys out which is rare as well. At the two-hour mark I started wondering if there was anything I should be worried about with her being in there so long… The only thing I could find online was a risk of a yeast infection that was supposedly rare. I also found a suggestion to add baby oil to the water. Of course it did not say how much so I obviously put waaaaaaay too much in because I noticed later on the bottle it said 1 or 2 capfulls! Anyway, Hana loved it and I actually had to drain the water at the three-hour mark to get her out and she still wanted to keep playing in there. Today she just relaxed for about 15 minutes before she wanted her diaper on and snuggle with Mommy while she watched Dora and drank her bottle. Rhondi then got her Bat Signal shortly after 7 and was off to Rockridge for the second day in a row. I made everybody breakfast while trying to make lunch, coffee and do dishes at the same time. I sure hope lunch was better than the omelette I made today. That was easily the worst omelette I have ever had. Rhondi’s taste buds must be dead as she said she enjoyed it. Rhondi left for work and I was determined to finish her Bday recap blog. Unfortunately the WordPress mobile app on my phone got an update the night of Rhondi’s party and it is just littered with problems. This meant I had to load the pics onto my computer and then into the blog… So painful! I hope this feature gets fixed as it has taken the blogging wind out of my sail. It took me until 10:30 and Hana was going stir crazy by then as we would usually be out of the house by 10. I changed her diaper, gave Hana a snack of cherry tomatoes and carrots with ranch dressing & finally cleaned up the breakfast mess. I also tried to do my tidying up that I usually do when Hana watches Dora. When she was done I cleaned her up and noticed she had a rash on her face which I assume is an allergy. I watched her closely for a bit and I did not see any other symptoms. This was strange though as she eats tomatoes (from the same batch) and carrots (from the same bag) all the time. We may have to get an allergy test as she had a similar rash a couple of weeks ago when she had bell peppers for the first time. Of course we also hadn’t done the dancing & chasing portion of Hana’s personal training regiment (she is my trainer BTW) so I had to be crafty with tidying between dances. She then decided to cut the dancing short and we did some very high paced chasing around the ottoman in the living room until about 11:30. I was not planning on going outside with Hana not feeling well so I thought I would try and do some laundry. Hana refused to get dressed. It was very strange because she said she wanted to help me with laundry when I asked her. She also helped me pick some clothes to choose and after some deliberation chose what she wanted. She wanted to do something with the pink dress, she just did not want me to put it on her which she made loud and clear. I made the decision that laundry would be done later and when I tried to put the clothes away she freaked out. I was lost and just went and took care of the Rhad finances to let her calm down. Once she calmed down, which did not take long at all, we played with volleyball for a bit before we headed back into her room and did a couple if “puggles”. Then she very politely asked for me to take her doll house out of the cupboard and place it on the bed… So cool & super cute! We are so blessed to have such an awesome daughter! I am so blessed that Rhondi was here for the first 21 months if Hana’s life to help her become such an awesome little person. I am doing everything in my power to keep up all the good things Rhondi has started. Believe me it is not easy but worth every ounce of effort I have to put in. Thank you Rhondi. I love you. Hana loves you very much too. Wow. What a day! First off I would like to say that everything did not go according to plan but everything worked out perfect. As you know Rhondi means the world to me and I try to show her that everyday but her birthday is a special day to her so I try very hard to make it as special as possible because she deserves it. The birthday entry below was done very quickly between errands I had to run for the party. I would like to back up to this morning because there were many things along the way that made it feel it would not be a perfect day at all. Hana had a very rough night with what appeared to be nightmares. I was scheduled to meet Jason at 5 out at Hana’s garden to pick up the volleyball net (and hopefully the ball if he was able to find his). Rhondi tended to Hana earlier in the night and I went and got her around 4am. We all laid in our bed and I slept in past 5am. I let Jason know that I was too exhausted to come meet him and asked him if he could come by our place with the net. I then promptly passed out again and missed both calls and texts from Jason as he waited outside for me. Obviously this was not only extremely rude but embarrassing to say the least and apologized for the second time in the day and it wasn’t even 6 yet! We all slept in past 7 when Rhonda got the call from her work. It was then that she decided to take the day off and enjoy her birthday which she never did in the past. 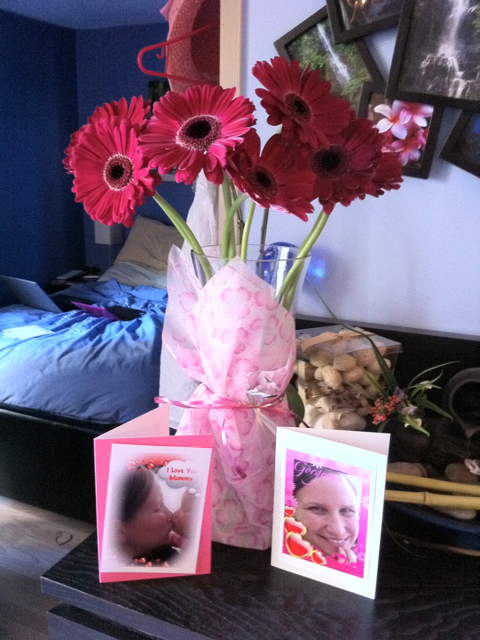 It was nice to have her home but I did have some surprises up my sleeve that would be hard to pull off with her home. I am not one to shy away from a challenge and I love hanging with my girls so I just kept moving and would just come up with a way to get all the things I had planned done – I just had to be more creative. I was unsure how the whole net thing was going to work but Jason was kind enough to leave the net by the compost area of the garden so I just had to find time to get down there. We all got dressed up and headed to Denny’s as I mentioned in the last post. This was a different routine for Hana and I must say I am very proud of her as she walked all the way to Denny’s at Davie & Thurlow (we live at Pacific & Thurlow) as this is up hill most of the way and is hard for those little leg at the best of times. One of our favourite things to do when we are out is looking around for cool things to find. Today was a great day as I found a very nice baseball glove on the side of the road which was among some abandoned clothes – I love living downtown. If I get a chance I will try to recap all the cool finds since we moved to the Rhad Pad back in May. I love walking down the street with Hana chanting “Find, Find, Find” as we pump our fist or waving something we have already found that day. 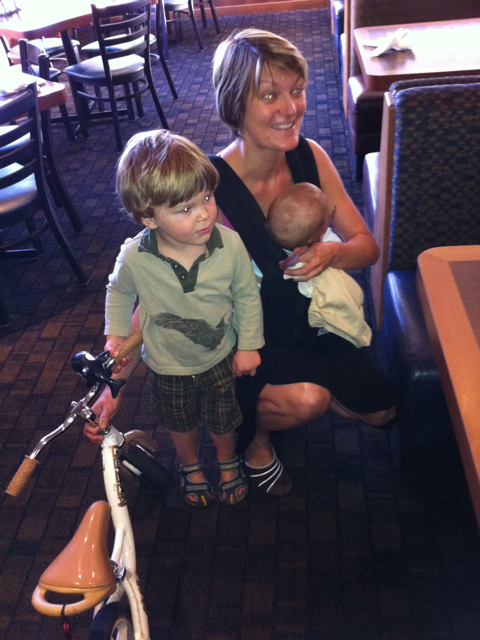 When we got to Denny’s we grabbed a booth near the TV as usual which is our favourite at any restaurant. Just as we sat down Rhonda saw Christine, Finn & Liam crossing the street as they headed to Finn’s preschool. I ran outside and across the street to say hi and invited Christine & Liam back to join us after they dropped Finn off. Christine let me know that she could not as she had to get ready as she is heading for Germany in the morning. She then remembered it was Rhonda’s birthday and decided to run over and say hi right then and there. So we all headed inside and Finn & Christine broke out into song right in the middle of Denny’s and sang Happy Birthday to Rhonda. The Spreters’ are awesome and continue to prove it in all that they do. Hana was very impressed with the singing as she was singing “Happy Finn” for the rest of the morning. Breakfast was a lot of fun and we headed back home to chill out a bit more and I started to put my altered plan to work. Rhondi was nice enough to do some laundry but that added another layer of complexity as it meant I really could not go anywhere as the laundry room is not in-suite. I had to come up with a plan to get her out of the house for a bit so I called SpaKwus to see if they had a last-minute booking for the massage that Hana & I bought as a gift about a month ago. They had a spot available but Rhondi could not get the massage she wanted (there were 3 to choose from) at that time as the lady was not working. The sauna portion of the gift was unavailable as it was all booked up. Miss Rhondi didn’t care, she just wanted her massage so all was set up to get her out of the house. The next big thing to do was get the net and volleyball squared away. I headed down to the garden to get the net that Jason had left there earlier. Unfortunately I was not clear at all with Jason what the volleyball net was going to be used for – the one he loaned to me was for kids (which he let us keep and will be awesome for Hana and her friends – thank you so much Jason) but Rhonda has not been able to play beach volleyball the past 2 summers and she wanted to have a full on serious game (seriously fun that is!). Also, unfortunately there was no ball. I immediately started to panic but just went back to the drawing board to see what I could come up with. I got on Craigslist as soon as I got back home and wouldn’t you know that someone had just recently posted a beach volleyball net in “like new” condition. They were asking $55 for it which was way too expensive but I had to make this happen as I had obviously dropped the ball (if I had one!) on the volleyball part of Rhondi’s Volleyball Beach Bday Party. I offered them $40 and let them know that I would have to pick up the net by 3pm. They accepted my offer but said that they were unavailable until Thursday. I let them know that I had screwed up and needed the net for today for a party I had planned for my wife. Cool Craigslist Story Alert… The girl then called me back almost immediately and said that she had arranged to leave the net in her backyard and that I could just leave the money in her mailbox! For a guy that does not like people very much it sure is nice to know that there is good people out there. I cleaned up my mess as I figured Rhonda wood be back soon and I had to try to hide the cake as much as a possible as I wanted something to be a surprise. I then got a text from her that they now had a sauna open for her and that she was going to be a while… perfect! Hana was a total mess so I threw her in the shower and then she had a bath for a bit. 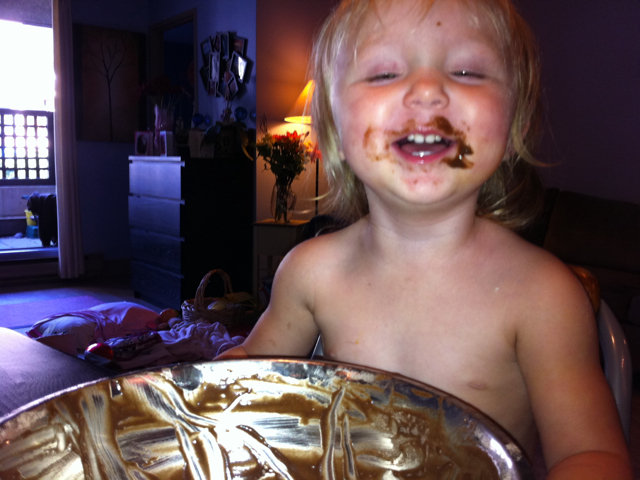 By the time she got out of the bath it was time for a nap and the cakes were ready shortly after that. The larger crock pot was cooked for an extra 5 minutes just on a comparison of how the smaller one looked. I took out this great cake caddy we got as a housewarming gift and the two sized cakes fit perfectly so I started to come up with an idea how to decorate the cakes. After letting cakes cool I proceeded to attempting the removal of them from their ungreased homes. I put a plate upside down on top of the smaller of the two and flipped it… nothing… It was completely stuck. I took a knife a scraped the edges and peeled up the bottom a bit. I then tried to flip it again and I guess I missed a spot as it did not come out in one piece. I stuck it back together and then flipped it onto the cake caddy. 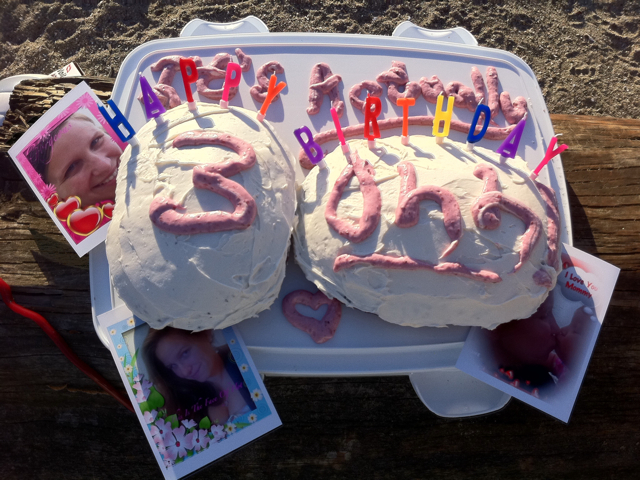 By that time I had a rough idea of the design and had to come up with how I was going to make the icing for what I wanted to write and, of course, I wanted it to be pink for Miss Rhondi. I came up with the idea to mix raspberry jam and some of the white frosting together and it came out perfect. The big cake had cooled by then and I had to find a better solution to make sure it stayed in one piece. I took a cheese knife (curved at the top with the 2-prong fork) and it worked fantastic to gently peel up the bottom. I flipped it and it came out perfect. I pu that one on the caddy as well and threw them in the fridge. By this time it was almost 3 and I still had a list of things I needed for the party. Luckily Rhonda was nice enough to grab a whole bunch of snacks and drinks when she was out a couple of days ago (which she said was not for the party) because I really had left things too late. I got everything ready to go down to the beach and headed out to get balloons which is one of her faves. I picked up 5 balloons as well as some candles and a tiara for the birthday girl to where at the party. It was now 3:20 (40 minutes from the start of the party) and I still had no volleyball. I called Erin to see if she knew anyone but she didn’t so I headed to the aquatic centre to see if I might be able to sign one out. The answer was no so now I was contemplating going to buy a new one with the money didn’t have. Just at that moment Jay, Leanne & Juliet called and asked if I needed any help. I said that I needed a volleyball so they came and met me and we all brainstormed on what we could do. I called Erin again and asked if she could go into Value Village on her way through which she was so awesome to say she would. Talk about making my problems other people’s! We all went up to the apartment and I had to round everybody up to start getting the stuff down to the beach. Jay & I loaded up with the 4 girls slated to follow close behind. 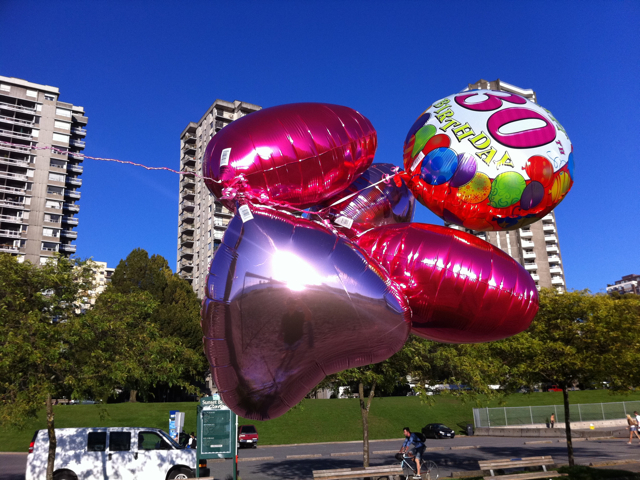 That meant that I had to hustle to the car to get the balloons before Rhondi saw them. 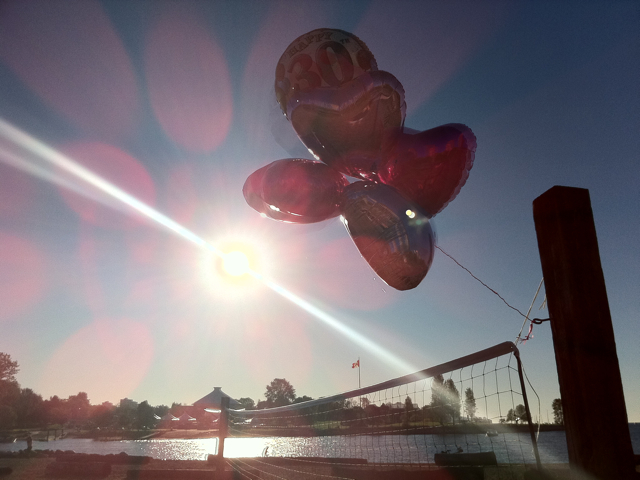 Jay & I set up the volleyball net right away and then went to tie up the balloons. The only thing was that in my haste along with the wind the balloons were like a big rat’s nest which took him and I about 10 minutes to untangle. That must have looked so funny – 2 guys untangling pink heart-shaped balloons on the beach! The first ones to the party was Melanie, Olivia & Caden. Rhonda, Hana, Leanne & Juliette followed shortly thereafter. I still had to go get all the things I had forgotten so off I went. It turned out that most of the people who came right away were kids and the net I bought was too big. So I headed back again to get the net Jason gave us as well as some healthier snacks to go along with the M&M’s, licorice and chips & salsa. I took Connor and Deedee with me so they could check out our place for the first time. When I got back to the party Erin & Luc made it to the party. Unfortunately there was not only a bad connection when I let Luc know that we no longer needed a volleyball, but Erin also tried to call me saying they were about to buy a volleyball and was there anything else we needed. I missed that call and did not get the voicemail until later that night. It was a bummer they spent so much time looking for a ball but now Rhonda has everything to play beach volleyball anytime she wants! Thanks Erin & Luc! I then snuck back home to get the cake, candles and matches. Of course I could not light the candles because of the wind but we all sang happy birthday to Rhonda and I got her to blow out a match. Right as we were about to cut the cake these guys came and basically tried to steal the volleyball court from us. Needless to say I was not happy about it at all. I kept my cool as they were not only interrupting us at a nice moment but we had the court with our net and we were just about to start playing. We all had cake and the reviews were very good which was nice as I was unsure how it would all turn out. 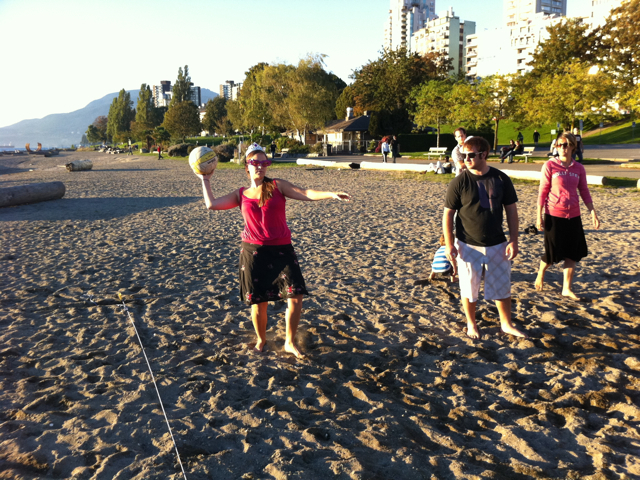 I then let everyone know that it was Miss Rhondi’s birthday wish to have a real game of beach volleyball. Everyone hopped to it and we took on these guys who were trying to steal our court. They were actually great guys and we had a blast. More importantly Rhondi got her birthday wish and looked great doing it! 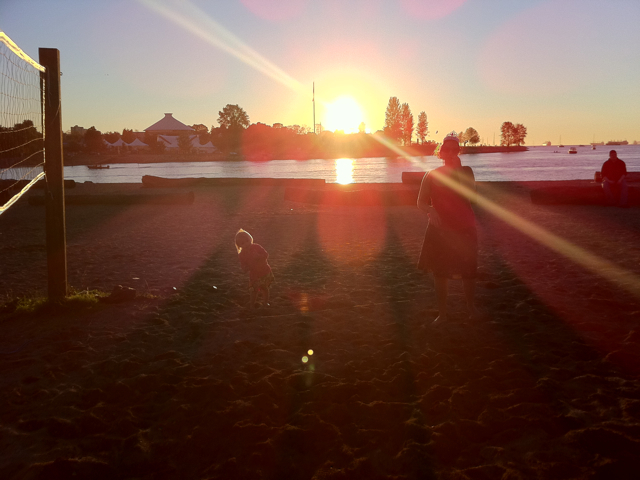 This picture above has my 3 favourite things: Rhonda, Hana & The Sunset! We couldn’t have asked for a better day. Thank you to everyone that made it out and all the calls from those who could not. Rhonda loves you all for ringing in a new decade with her in such a special day! Happy Birthday Rhad Mommy Miss Rhondi! Today is Rhondi’s 30th birthday… Doesn’t she look gorgeous???? We are lucky to have her home from work. We went out to Denny’s to get her free breakfast and the weather is awesome for this afternoon’s Volleyball Beach Party. Check out this video of Hana singing Happy Birthday with me to Rhondi. We love you very much Rhondi. Enter your email address to subscribe to RhadLife and receive notifications of new posts by email.